Shy children tend to feel uncomfortable and anxious in most situations. If your child is shy, it’s important to help your little one to overcome it when they are so young. 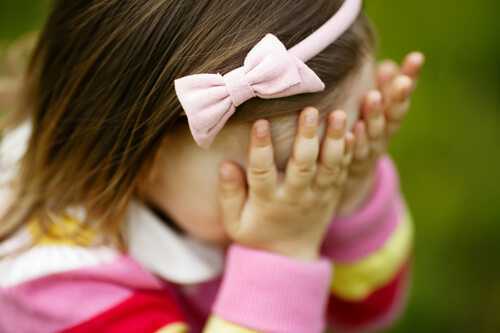 Kids who suffer from shyness may grow up to be shy adults or they may grow out of it. As a mom, you can’t simply sit and wait for your kid to grow out of it. It’s not easy to overcome shyness, but you can do a few things to help your shy child become more comfortable and confident in social situations. Never blame your child for being so quiet and shy. Never compare your shy child to more active kids. If you have such a bad habit, break it right now. It may be your fault, because you are a parent. You may say that you work hard to buy anything your kid wants, but they don’t actually need money and things, they need your attention and care. You should teach your child how to communicate effectively and feel comfortable in any social situation. If you are a shy person, don’t blame your little one for being shy as well. Every child has their own personality. It may be tempting to try to change your shy child overnight or in a week, but don’t do it. You can help them to overcome shyness, but you can’t change them, no matter how hard you try. If you often make your child behave more outgoing, and you criticize them when they are quiet, you do more harm than good. Your child may become even shyer. Instead of trying to change your shy child, encourage them to try new things. The more things your child will try, the more chances they will become more outgoing. Motivate your child to try different classes, such as painting, swimming, dancing, singing, crafting etc. It will help your shy child to spend more time with other kids and make more friends. One of the best ways to help your child overcome shyness is to invite other kids over to your home as often as possible. Let your little one learn how to communicate with other children and make more friends. Many parents worry about their quiet children, but they don’t realize that they might be guilty for it. If you allow your child to watch TV or play games online instead of playing with other kids, it’s no wonder they are quiet and shy. Enrolling your child in a drama class can also help them overcome shyness. But don’t do it suddenly. Start slowly. Perform some plays at home in order to prepare your child for a drama class. It’s easier to pretend to be someone else than to be yourself. See if it works for your child, then why not? Most children enjoy being on stage so chances are your little one will enjoy it too. If your child doesn’t want to take a drama class or play with some kids, don’t push them. Shy children always avoid doing anything that makes them feel uncomfortable. If you push your shy child into taking a drama class, they won’t thank you. They will feel hurt and they will think that you don’t understand their feelings. No matter how busy you are, you should find time to talk and listen to your shy child. It’s so easy to say, ‘Go and play some games in your room, mom is busy.’ Your child has feelings, thoughts and opinions. They need someone to talk to daily. Just like you share your feelings and opinions with your parents, friends and coworkers, your child wants to share their feelings as well. Children don’t tend to share their opinions with strangers or friends. As a parent, you should learn how to listen to your child and find a few minutes to talk to them when they ask you about it. It’s hard to realize that your child is shy, but don’t panic. It doesn’t mean that there’s something wrong with them. As a parent, you can help your shy child, but don’t expect too much from them. If you have any other tips for helping shy children, share them with us, please.